It's Sunday evening. The house is quiet, back to just the two of us. I smile, remembering how different it was last night with 8 adults and 3 very active little ones. Rollicking laughter, balloons galore. The Happy Birthday song sung by all, with great hilarity as everyone attempted fitting the names in, all in different order. A Little Miss helps blow out the candles. Katie, our daughter-in-law, made the cake - a scrumptious poppy seed chiffon, filled with jam and vanilla pudding and covered with whipping cream. It's a family favorite from years ago and I'm tickled that she made it. Church this morning and this afternoon we took our daughter to catch a ferry back to Vancouver. The two of us stopped in Sidney by the Sea for a walk along the water. Blue sky. Deep blue ocean that seems to hold all the richness of summer light. 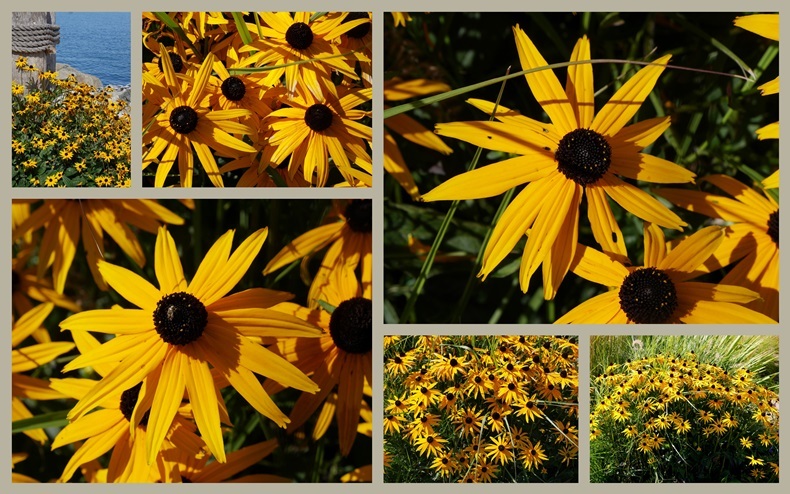 Along the pathway, cheery clumps of golden Black-eyed Susans nod at passersby. Tall masts reflect in the water. Autumn is in the air - crisply fresh. The earth gives off the warmth it gathered during summer's height. A fine day to savor life, arms resting on the fence rail overlooking the marina, face lifted to the sky. What fun, to celebrate so many lives at once - and your table was beautiful. I like the steep sloping sides of that cake. Happy Autumn! A beautiful celebration--your photos are extraordinary. LOVE the cake! Happy Birthday to the three! Your photos are exquisite. I want to walk along that sea. It all sounds lovely. I'm not spying the lighter at all. And the happy yellow colour is found in the pretty flowers as well. 3 x belated Happy Birthday greetings. Have a lovely Mosaic Monday! You live in such a beautiful place! Enjoyed your photos and a peek into your family celebration. Pretty table and the lighter blended right in with your color theme! Wonderful photo of the boats!! What fun! Such a lovely table and yummy looking cake. I hope you have a wonderful week! Hello, looks like a fun birthday celebration. The cake looks delicious! I love the pretty black eyed susans and the view of the sailboats. Enjoy your day and the new week ahead! Happy Birthday to the three celebrants! It looks lovely and the cake looks amazing! Have a blessed week ahead. Oh I love the yellow lighter! It looks like something a professional stylist put there to add a little whimsey. That birthday cake is so pretty and sounds delicious. Is the recipe in your archives? You are so fortunate to live in such a beautiful area! Your cake looks yummy. You seemed to have a fun birthday party. Have a nice week! Big family birthdays are so fun! Glad you had time with your daughter, too, so much beauty where you live Lorrie! Happy Birthday to all. We only have one birthday in September and that is Dear's. That was a great cake your daughter in law baked! Thanks for joining Mosaic Monday Lorrie. Beautiful last days of summer. I put black eye susans on Facebook today. You described what sounded like a fun family weekend. What a beautifully set table and that cake looked amazing! Great photos and that mosaic of the Black-eye Susans was so lovely! This looked like a lovely way to spend one's weekend. Fabulous party, yummy cake and lovely flowers. Just beautiful scenery and what a happy celebration!! Birthday celebrations are such fun! The cake looks fabulous and how sweet that it's a family favorite. I especially loved the lighter on the table, Lorrie...something that I would do. A lovely post and belated happy birthday to all. Sweet photo blowing out the candles and your daughter-in-law's cake looked gorgeous and I bet tasted fantastic. All very pretty photos! Seriously..what a sweet post..loved it. That cake looks wonderful!! And so are the family shots. A wonderful time. Even if there were no pictures, the words are lovely and string together so well. I could even see the lighter left on the table in a moment of forgetfulness. Of course, I would not have known it was yellow and blended in so well that perhaps you did not see it. What a wonderful combined birthday celebration and a very delicious looking cake! It always looks so pretty in your part of the world, Lorrie! Happy Birthday to all. The cake sounds so good. With a table so nicely set, dinner had to be every bit as delicious. But isn't it nice then to have the house back to yourself? Beautiful photos (and I LOVE that lighter :) That b'day cake is beautiful ! Smiling...at the happiness of it all! It looks and sounds like a wonderful celebration and a fun time with family. Family time is special that's for sure and it's good that your family lives close enough to celebrate together often. Your table runner is lovely. I love Sidney by the Sea. My sister and brother in law live there and it's such a lovely place to walk by the sea. Have you been to the bakery on the Main Street. It is in the second block on your left as you are walking up away from the ocean. It has an amazing variety of tasty treats! Have a lovely September! Happy Birthday one and all! What a lovely cake. Love the shot of the sailboats...I always miss the water when I come to visit your blog. That cake sounds delightful, and how nice that you all get to celebrate together. B days are fun! That cake looks amazing! And all is well! Happy birthday to all! You have such a lovely family. The party must be precious time for you all. The cake looks delicious, and the candles on it are pretty. The table set is nicely arranged for the party. How exciting to see that the yacht harbor and the reflection on the water. Here in Japan, typhoon has just passed away, causing serious flood in Ibaraki prefecture. TV news keep reporting it from morning to evening today. Have a happy day, Lorrie. Lovely photos Lorrie and it looks like you had a wonderful celebration!! Happy Birthday to one and all! From the beautifully set table, (yes, including the lighter), to the scrumptious family favourite, a fun and festive time surely was had by all. Your pics of the ocean and sailboats remind me of the Aegean, for which I am longing for; it's been a hot and humid Toronto summer. Your mosaic is so cheerful -- like a dose of sunshine. You certainly live in a beautiful area with lots of inspiration for picture taking. I hope you have a wonderful weekend! I love the "happy birthday" photo Lorrie! The cake looks amazing - clever DIL. Your walks look much like mine by the waterfront - always boats!